A little subtle grooming can go a long way. We’re not talking a face full of make-up – no, we’re talking about a little concealer after a hard night out, or a touch of bronze to perk up a dull complexion. It’s only fair that you want to look your best, and sometimes that means a bit of help is needed. 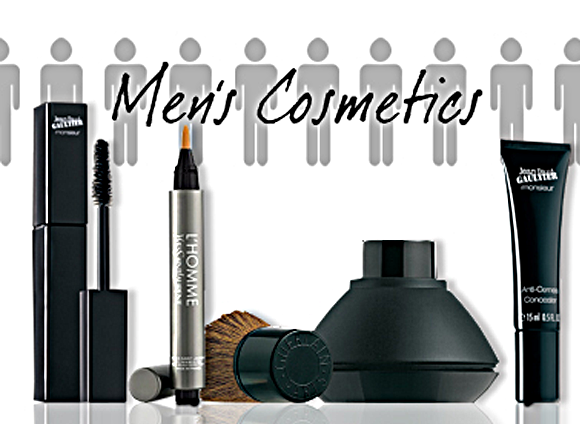 Men’s cosmetics are different to women’s in that they’re specifically designed to appear as natural as possible when worn. That means no glitter and no heavy pigment, plus the packaging tends to be far more subtle. Take a look at our favourite men’s cosmetics below.. one small change to your everyday routine could make a world of difference! Eyebrows frame your best feature, your eyes, so tidying them up is a must. Your peepers will become more striking and defined, and you’ll look more ‘put-together’. The clear gel of the JPG Monsieur Brow Groomer is shot through with setting polymers that keeps brows in place all day, and the tapered brush allows for precision combing. If you’ve had a bit of a late one, splash some cold water on your face and then get to work with the anti-fatigue L’Homme Touch Eclat pen. The lightweight concealer works to both treat tired skin and cover dark circles with light-reflecting pigments, so you look more wide awake. Simply dot on with a light touch, and then blend until all of the eye contour is covered. This bronzing powder has been designed especially to suit men’s specific needs, with a large and sturdy brush alongside elegant and discreet packaging. The powder comes in just one colour, Ultra-Naturel, a perfect subtle bronze that suits all skin tones. With not a trace of tell-tale shimmer, the colour enlivens the skin and makes for a perfect face sculptor. If your skin’s looking a little worse for wear, perfect your canvas with this lightweight concealer. Imperfections are completely covered in the most natural looking way, with brightening micro-particles that reflect light away from problem areas and a subtle tint that blends seamlessly with your own skin. Simply pat on and blend to cheat your way to perfect skin. This entry was posted on Wednesday, September 7th, 2011 at 10:35 am and is filed under Make-up, Men. You can follow any responses to this entry through the RSS 2.0 feed. You can skip to the end and leave a response. Pinging is currently not allowed.